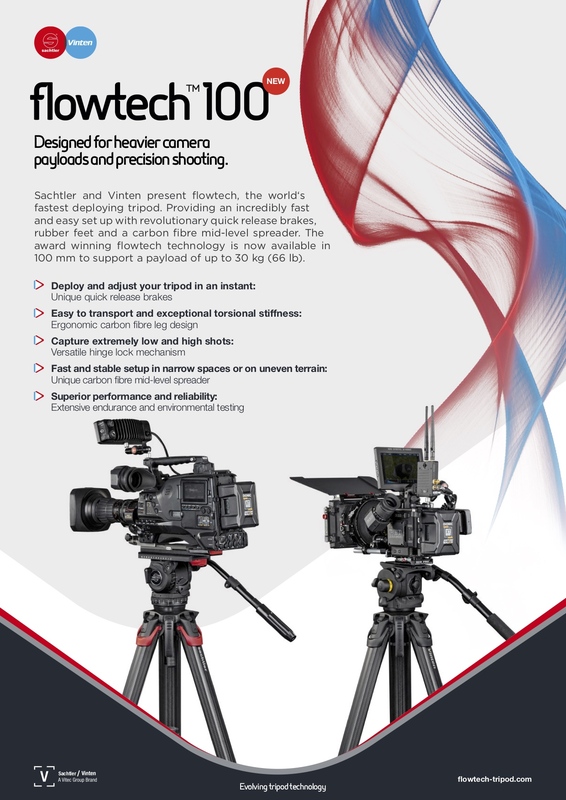 Just over a year ago Sachtler announced the Flowtech 75. The tripod was a direct consequence of being able to think about what modern materials can do and how those capabilities should influence what a tripod actually looks like. Changing the very design that has been so successful for Sachtler over many decades was a risky endeavour. You don’t want to change the design just because you can, you only do it if you end up with a product that is better than what was already available. Thinking outside the box paid off for Sachtler and the Flowtech 75 has been very well received by shooters around the world. Almost immediately after the Flowtrech 75 was announced came the question “When can I get a 100mm version?“. Well, now you can. Today Sachtler officially announced the Flowtech 100, which is essentially a larger version of the Flowtech 75, with some improvements. 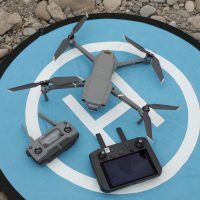 I was first shown a prototype of the Flowtech 100 more than three and a half years ago and my initial reaction was one of surprise. 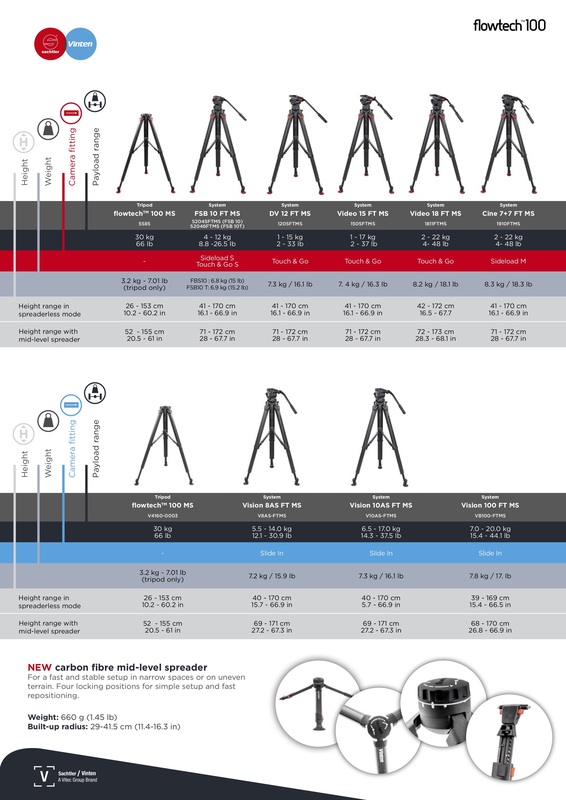 Comparing the Flowtech prototype to a traditional tripod was a bit like the change involved from FCP 7 to FCP X – different in some ways, improved in some ways but perhaps not to everyone’s taste. I gave my honest feedback about what I liked and didn’t like, as did many other cinematographers who were shown prototypes. I have seen numerous prototypes over the last few years and the design continued to improve. Sachtler told me that they designed the 75mm Flowtech with the 100mm version in mind, and the overall design and optimization has been ongoing for more than 2 years. Sachtler started work on finalizing the design of the 100mm version after the 75mm version was launched at IBC 2017. The work over the last year has included the finalization of the tripod design and a new Flowtech 100 midlevel spreader. A Flowtech floor spreader will be available later this year. 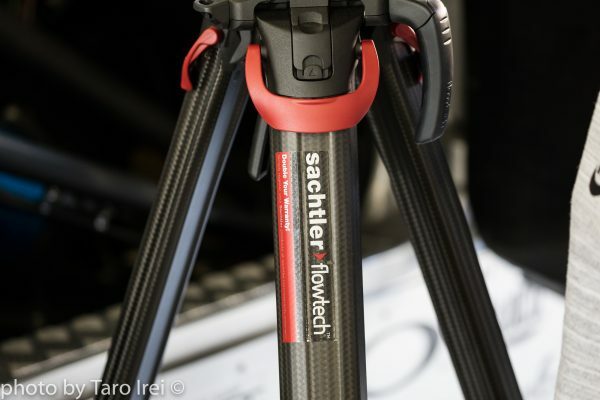 When I asked Sachtler why the Flowtech 75 was released before the Flowtech 100 they told me that the main reason is that they believe that they have developed a better, more optimized set of products because of this approach. 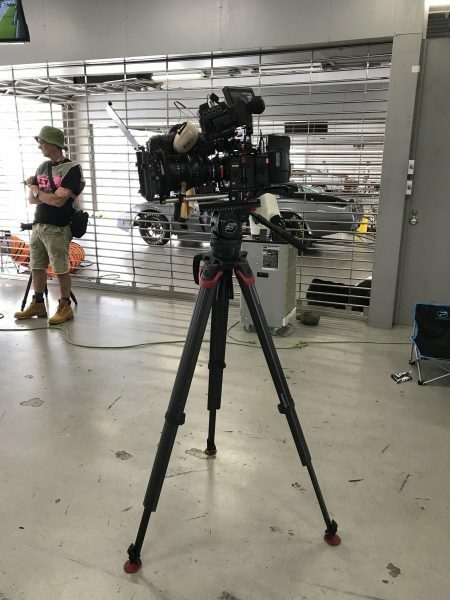 To optimize both designs for weight and size Sachtler had to be meticulous about every design detail, so starting with the tripod that was smaller and lighter made the most sense. If Sachtler had of decided to start with the 100mm they would probably have made some early decisions that would have inherently made the 75mm version tripod a bit bigger and a bit heavier. I think Sachtler made the right move releasing the Flowtech 75 before the 100mm version as it gave them a chance to gauge the market to see what shooters liked and didn’t like about the design. I like it when companies consult with end users on how products can be improved because ultimately the end user is the one buying your product. 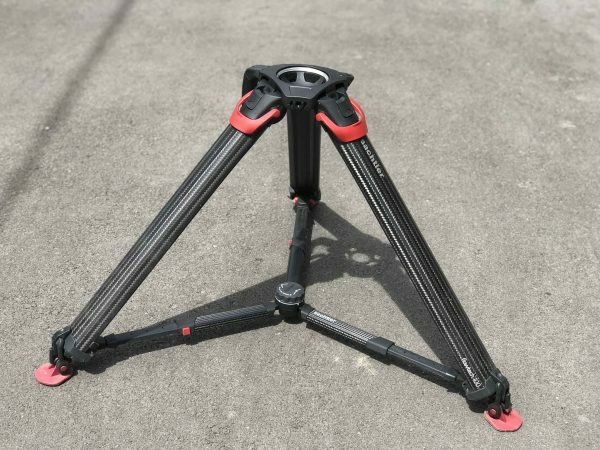 Sachtler told me that they have sold thousands of Flowtech 75 tripods, and the numbers sold have exceeded their expectations by more than 50%. Who is the Flowtech 100 aimed at? The core target segment is TV networks and freelance cameramen/camerawomen working in ENG and EFP. In addition, all typical 100mm applications, like wildlife, commercial and documentary productions are also potential users of the Flowtech 100. 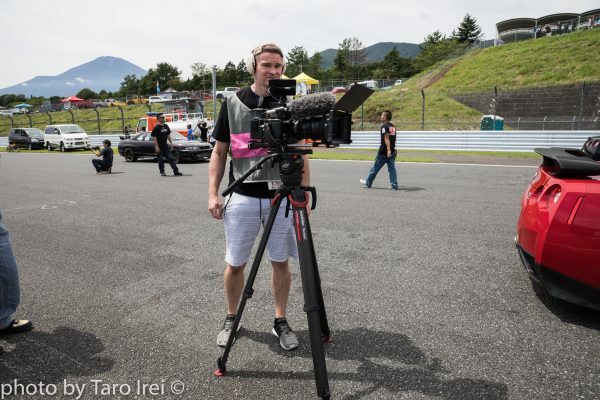 TV networks, news crews, and EFP operators widely use 100mm tripods. These are tough customers who want to buy a tripod that will last them at least a decade in many cases. Are there any design differences between the Flowtech 75 and the Flowtech 100? If it ain’t broke, don’t fix it, just make it better. 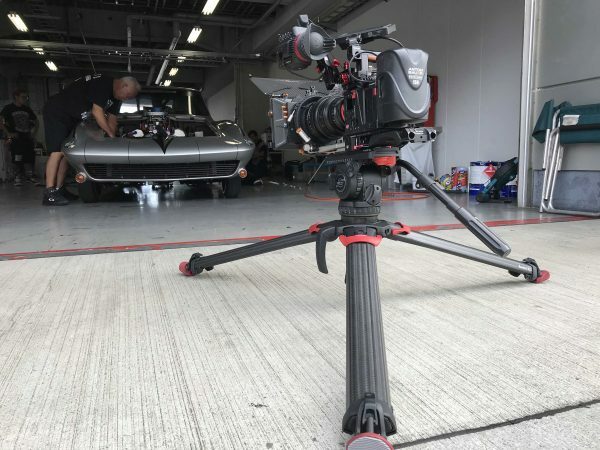 Sachtler deliberately made sure that they kept all of the things people loved about the Flowtech 75 when completing the design of the 100mm tripod. Sachtler didn’t ruin any of the details that make the Flowtech 75 work so well, and at first glance, it does look very similar. But, underneath the tripod, there have been some significant changes to allow it to perform at the higher payloads that are expected of any 100mm tripod. 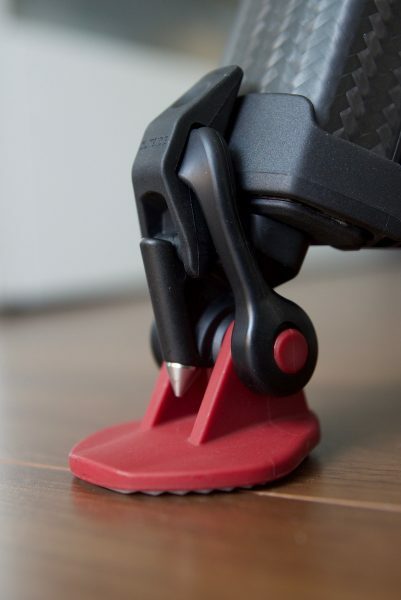 The leg-clamping mechanism has been improved significantly so that each leg holds in excess of 30kg. The quick-release levers at the top of each leg are completely new and larger with new internal cast parts to make them stronger. All of the castings at the top of the legs upwards are completely new and larger so they are stronger to cater for the higher payloads and bigger heads, several moldings are also completely new and it has the same height. In total, approximately 30% of the main components have been redesigned and are new on the Flowtech 100. 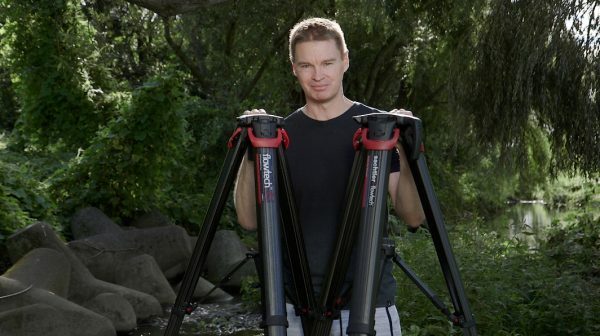 Sachtler says that the Flowtech tripods are “the most widely tested, robust product” they’ve launched. They have been put through their paces from -40°C to 60°C and tested in water, salt water and swamps, both at the factory and on location. In fact, the Flowtech 100 was being tested and used during this year’s Winter Olympics in South Korea. 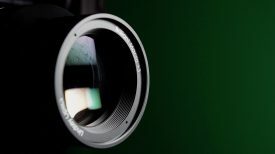 Tripods, especially 100mm bowl head versions used by news, and documentary shooters need to be extremely robust and work in just about any weather or conditions. Tripods are not something you replace very often and they need to last you for a long period of time. Often tripods are thrown in the back of cars, transported on planes in soft cases, and used in deserts, saltwater, and snow. If water gets into the nested legs the internal design is optimized to get rid of water via drainage holes. The whole tripod is screwed and clipped together to aid repairs in the field. Tripods have to withstand a lot more abuse and wear and tear than just about any other product you use. 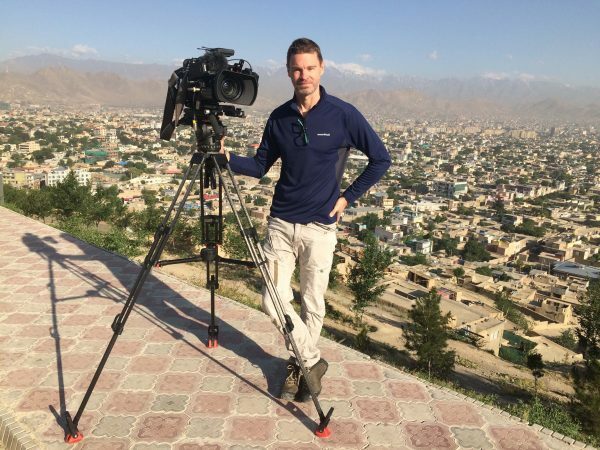 I have used my Sachtler tripod all over the world in war zones, natural disasters, snow, rain, extreme heat, and just about any other environment you can think of. We might take it for granted, but a good tripod never lets you down and can handle anything you throw at it. 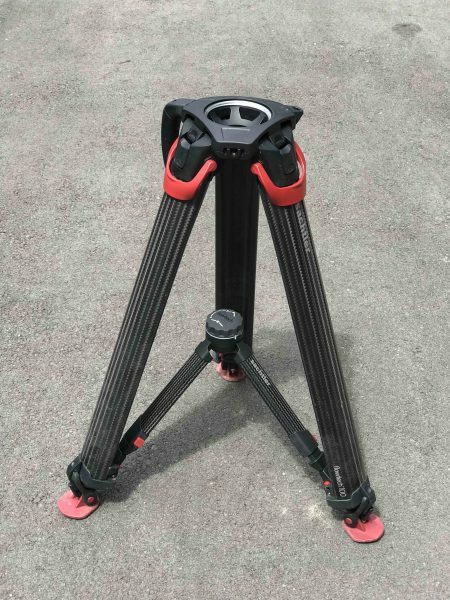 The Flowtech 100 (even the prototypes I have tested in the field) have been very solidly made and up to the standards I would expect from a professional tripod. 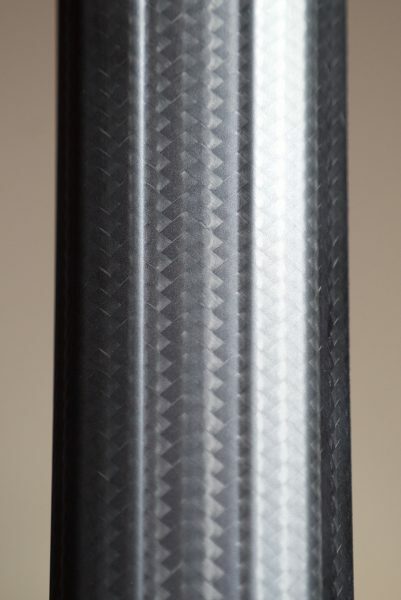 The weave of the carbon fibre has been designed not to ruin if it suffers a tear or crack. The tripod legs are a lot more rigid and stronger than the Sachtler Speed Lock CF. 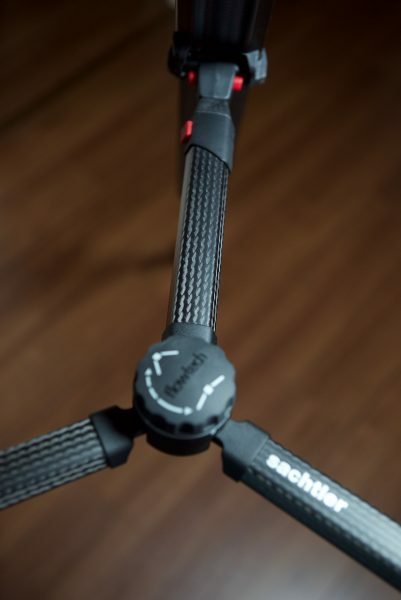 When Sachtler released the Flowtech 75 they said that it was 265% stiffer than the Speedlock 75 legs. 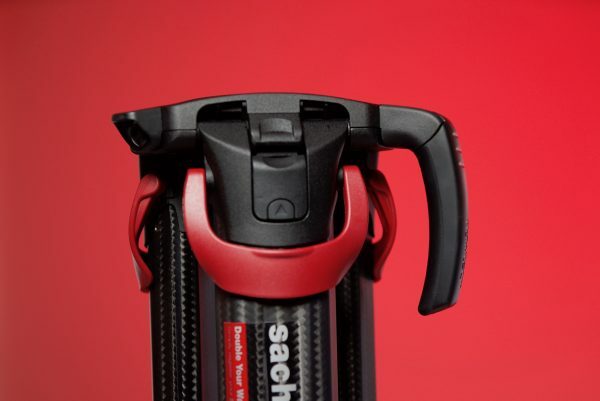 According to Sachtler the new Flowtech 100 is 75% stiffer than the ENG 2 CF and 25% stiffer than the Speedlock 100. I weighed in the popular Sachtler Speed Lock CF at 4.4kg (9.7 lb). The Flowtech 100 weighs in at 4.2kg (with the carry handle attached) according to my scales. 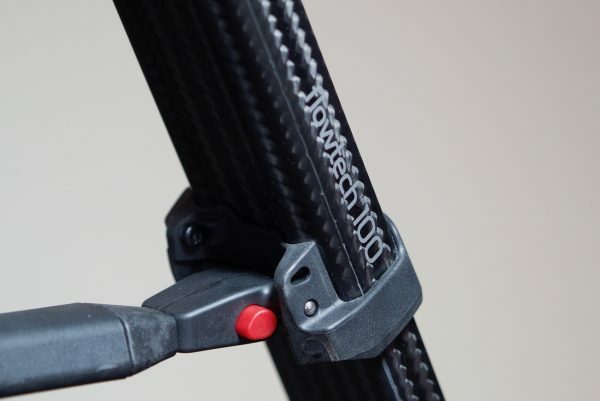 The Flowtech 100’s carbon fibre legs are not nearly as wide as the Sachtler Speed Lock CF. 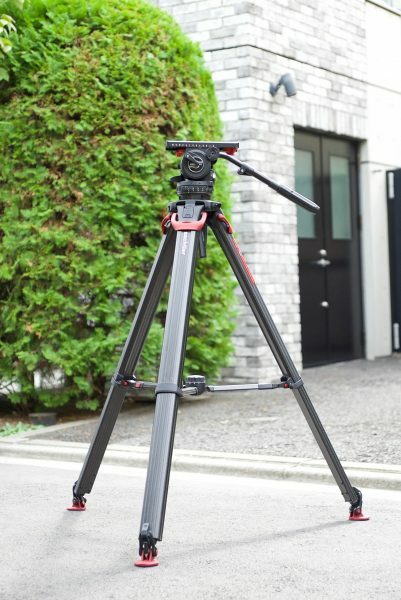 The Sachtler Speed Lock CF’s legs are 11cm (4.33″) wide at the top. 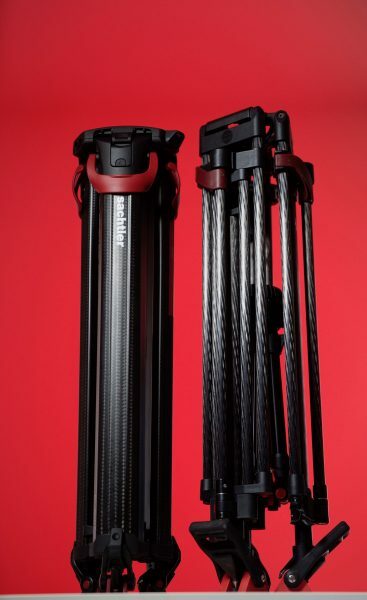 In comparison, the Flowtech 100’s legs are only 6.5cm (2.55″) wide at the top. Above you can see the difference between the top of the Flowtech 100 (on the left) and the Sachtler Speed Lock CF (on the right). This is where the Flowtech 100 is a lot more rigid and you don’t get any flexing between the legs and the top of the tripod. This is in my opinion, one of the best design changes. I don’t want my tripod flexing under heavy payloads. Deploying the stages is a little different to a traditional tripod. Brake handles sit at the top of each leg, and when loosened you can raise and lower the height of the tripod. They’re intended for single-operator use so there are no controls at the bottom of the tripod: everything is where your hands would naturally fall while working a camera. The legs all lock with one lever, located at the top of the tripod on all three sides. 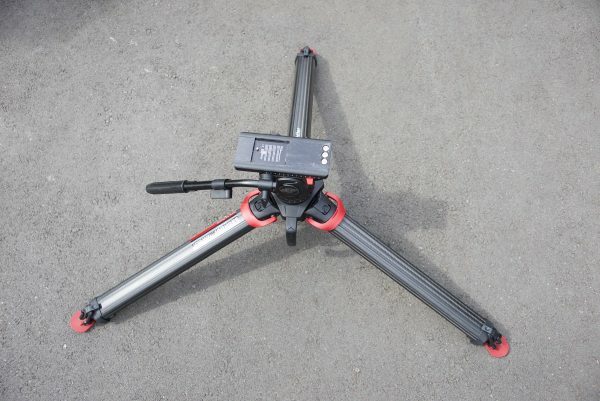 This system is very clever and it is certainly a lot quicker way of making height adjustments to your tripod. Once you use this system it’s very hard to go back to an older tripod. 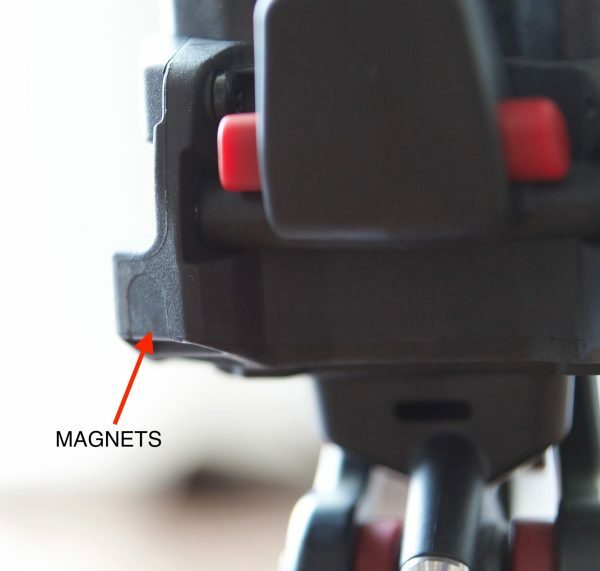 When the legs are folded they stick together thanks to magnets embedded near the tripod feet. I love the magnets. There is nothing worse than picking up a tripod to carry it and having the legs spawling around everywhere. The magnets make it so much easier for carrying and transporting the tripod. The profile of the legs also offer a nice flat surface and this makes it a lot more comfortable for carrying the legs on your shoulder. These might sound like minor things, but take it from someone who often works on documentaries as a one-man band and has to carry his own tripod long distances, this makes a huge difference. 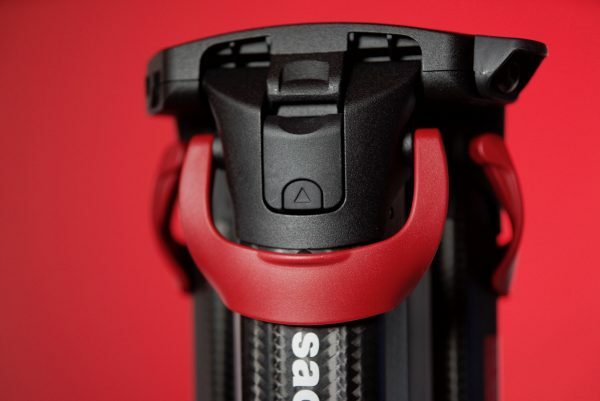 This is probably one of the most dramatic changes to Sachtler tripods. With the addition of a hinge lock mechanism, you can easily (well maybe not so easily) adjust your tripod to go between low and high shots. The hinge lock mechanism has two positions. In one position it is unlocked, and in the other, it is locked. In the default locked position, the legs won’t go out further than a certain point. If you want to go lower, you push down on the hinge to unlock the mechanism. This allows you to adjust the leg further out to three pre-set positions, 20º, 46º, and 72º Now, this system does take some getting used to and the first few times you use it you may find it a little confusing. I’ll now attempt to explain this in more technical terms. 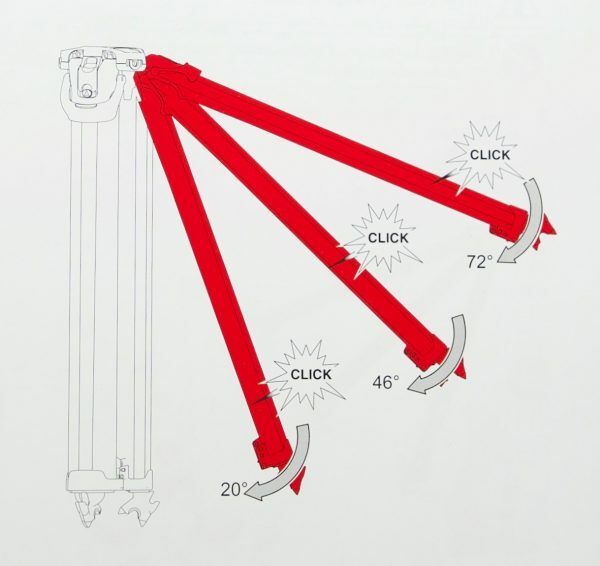 If you aren’t using the spreader when the hinge lock is in the engaged position (pushed upwards) the legs will stop at pre-set positions when you are moving them out. These positions are 20º, 46º, and 72º. Now for instance, if we want to open the tripod legs out (past the normal 20º position), we need to disengage the locking hinge by moving it to the downward position while the legs are fairly close together. Then we engage the locking mechanism (I know this is sounding confusing, but bear with me) and start pulling the leg outwards. In this locked position the leg will stop at the 46º, and 72º. I think a far easier way to do it, is to unlock the hinge release (downward position) and pull the leg all the way out till it’s at 90º. Once it’s at 90º you then lock the hinge lever (upwards position) and start moving the leg in until you get it at the desired position. 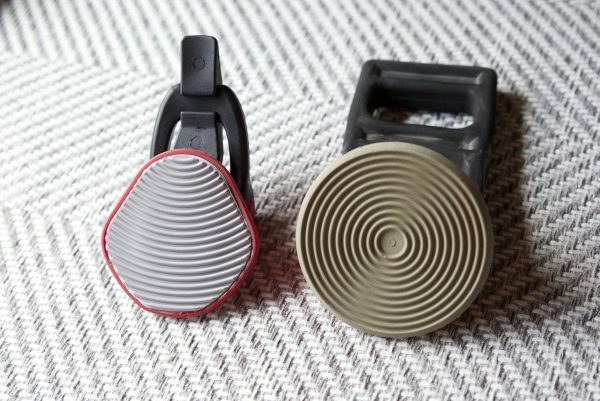 Every time you reach a position point (72º, 46º, or 20º) you will hear an audible “click” sound. Many stills tripods use this mechanism with preset positions. Make sure you watch the video at the top of the review as it’s easier to grasp how the hinge lock system works than trying to explain it with words. I also think it is far easier to make the hinge lock adjustments, particularly if you want to put the tripod out at 72º to get a low shot if you remove the camera first. Trying to do it with a heavy camera payload on top of your tripod is not easy. All three legs can be adjusted independently, which makes it really nice if you are using the tripod on a slope or uneven terrain where one leg needs to be spread out further than the others. This system is mechanically very clever, but it’s not the most intuitive for the operator. Unfortunately, the only way you will get familiar with it is to repeat these steps over and over again. Eventually, you will get comfortable with it, but be prepared to be frustrated for at least the first few days. On one more note, if you are going to put your Flowtech 100 on a dolly, it’s important to make sure that the hinge lock is set to the off position (down) to avoid the risk of damage. Changing from spikes to feet is now a lot easier. If you own a Sachtler tripod you will be well aware of just how much force is needed to remove the feet. Now it’s possible (well, just about) to take them off with one finger. The only problem with the feet being easier to take off is that they are more prone to being lost if they get snagged on something. On one of the prototypes, I ended up losing two feet after shooting in a forest. The feet got caught in the undergrowth and came off without me realizing (I guess this was the reason the original plastic feet were so hard to remove). 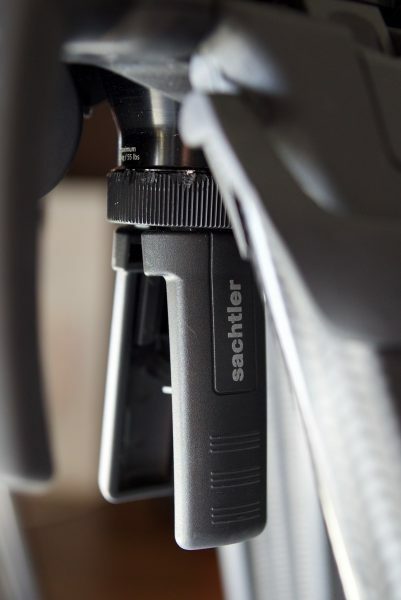 Sachtler did take feedback, as I wasn’t the only one experiencing this problem and redesigned the feet to be a little stiffer, while still remaining easy enough to take off. 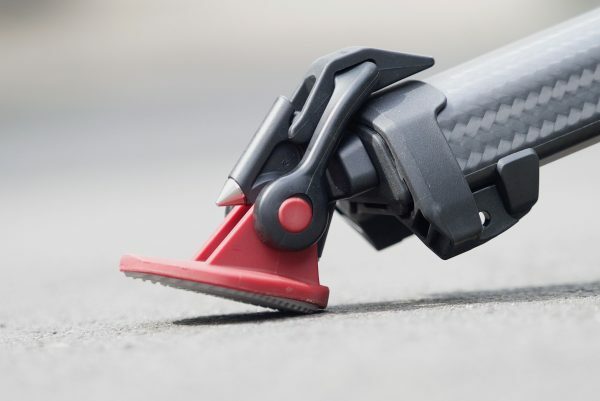 My colleague Taro Irei came up with a clever solution on his Flowtech 75 to prevent you from losing the rubber feet. With just a simple piece of string, you can attach the feet so they can still be removed, but stay attached to the actual tripod. I did the same thing with the Flowtech 100 as an added measure of security. I’m still not 100% sure that I like the design of the new feet. They are a lot smaller than the feet that come with other Sachtler 100mm tripods. The Flowtech 100 feet are the exact same ones that come on the Flowtech 75. In all honesty, I think these feet are too small for the Flowtech 100. 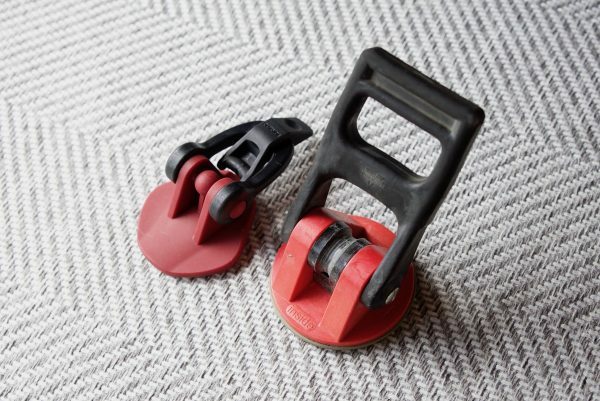 Sachtler has done this so the Flowtech feet are compatible with both the 75 and 100 versions. I’m still not 100% sure why they need to be compatible, ultimately I guess it saves on manufacturing costs. I did find that occasionally (especially when using the tripod at 72º) the feet didn’t flatten down correctly and I had to push them down with my feet or hands. 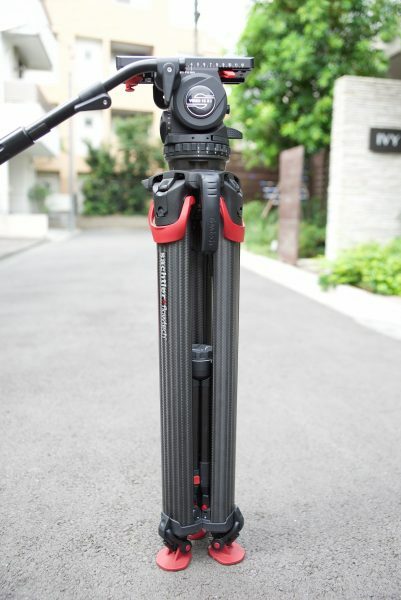 The carry handle is also extremely useful and I found it was not only good for carrying the tripod, but also for giving you some extra leverage and support when you are adjusting the height. If you are using a heavy digital cinema camera or ENG camera then the handle makes a big difference. 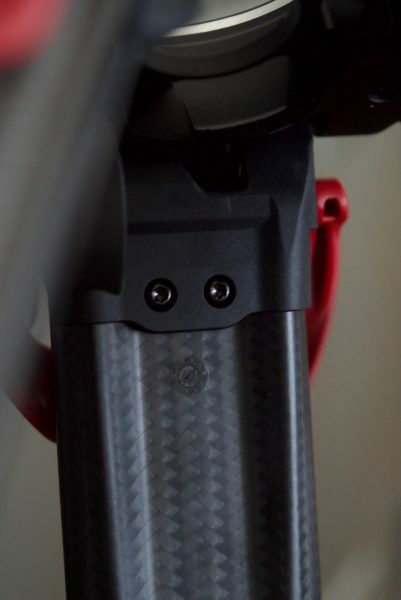 There are two separate spots where you can mount the carrying handle. 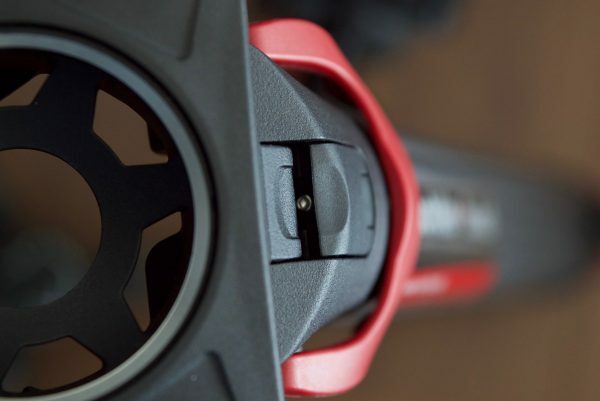 This handle comes standard with the Flowtech 100. The Flowtech 100 works really well in conjunction with the optional SpeedLevel Clamp. This is one of the things I didn’t like about the Flowtech 75. 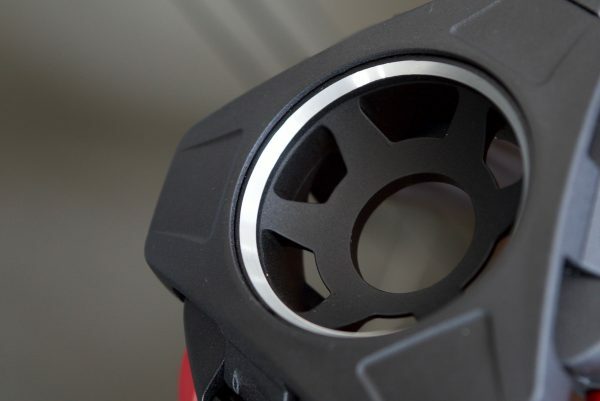 Because of the physical size of the Flowtech 75, you couldn’t use it with a SpeedLevel Clamp. 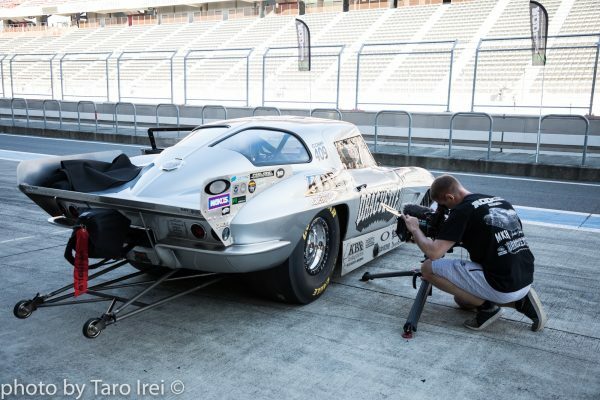 The SpeedLevel clamp, in my opinion, is one of those must-have items. It is far quicker and easier for making tripod head adjustments. 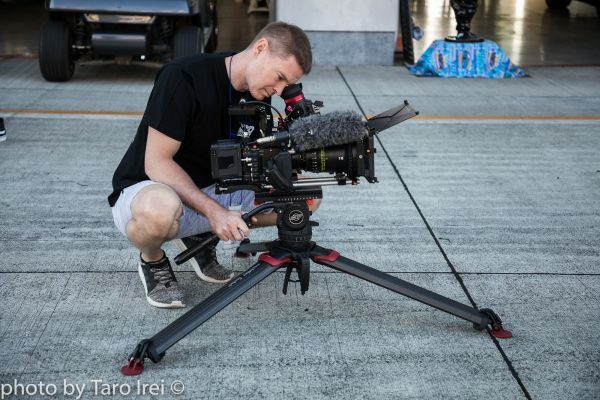 I would have liked to have seen Sachtler include a SpeedLevel clamp with the Flowtech 100. So how does it differ to existing Sachtler 100mm bowl head tripod legs? 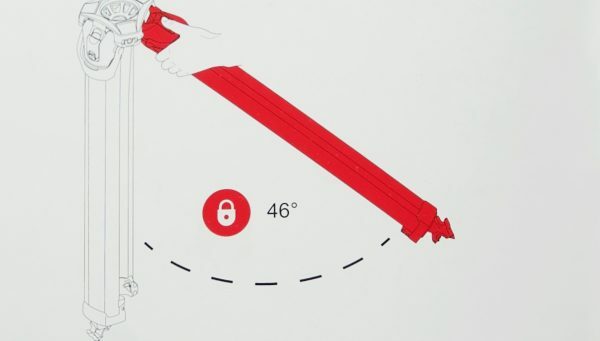 Now, these are the measurements when the Flowtech 100 is being used in the default position without taking the mid spreader off and unlocking the hinge lock mechanism. If you take the spreader off and unlock the hinge lock mechanism the Flowtech 100 can literally go as low as 25cm (9.84″). In saying that if you don’t mind the hinge lock mechanism not being engaged you can actually go lower. If you have the carrying handle attached, you can actually use it to support the tripod if you go really, really low. While this is something I’m sure Sachtler doesn’t recommend (in fact they caution against using the tripod at positions greater than 72º), I found it worked well for that odd shot you need to do. In the wild west, speed was key. The fastest gunslingers always had an advantage (unless you were shot in the back when you weren’t looking!). For a completely different type of shooter- news or documentary cameraman/camerawoman, the same is true. Speed is the second biggest advantage the Flowtech 100 has. 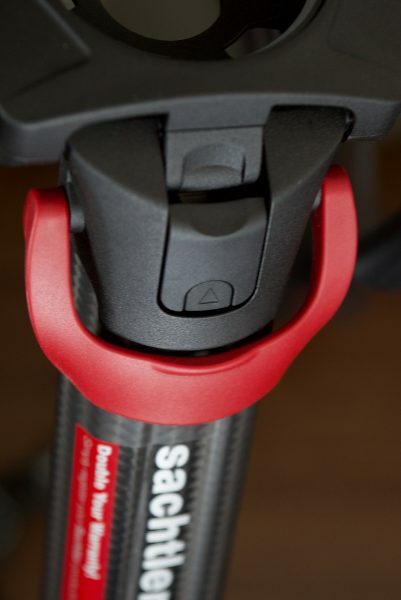 Everything on the tripod has been designed with the concept of letting you make adjustments as quickly as possible. Until you have used the Flowtech 100 you won’t appreciate just how much faster it is compared to say the Sachtler Speed Lock CF. When you are shooting news or documentaries you often need to move quickly and the last thing you want to be doing is messing around with a tripod and potentially missing a shot that only happens once. 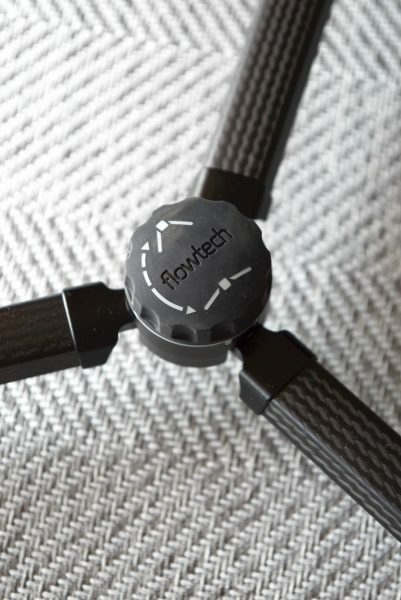 In terms of raising or lowering your tripod quickly, nothing is as fast as the Flowtech. No other tripod that I know of can come close. The new mid spreaders are very quick to adjust in terms of spreading them out. All you do is press in a button and move the spreader further out. The mid spreaders are also a lot faster to take off and put back on the Flowtech 100 than they are on the Sachtler Speed Lock CF. The center of the mid spreader also has clear directions as to which way you turn the knob to either flatten or raise the spreader. This is much more intuitive than the design on the mid spreaders on the Sachtler Speed Lock CF. Again it’s all about simplicity and speed. You want to make adjustments quickly and get on with shooting. The nice thing about the Flowtech 100 is you can actually use it in most cases without the spreader. Because of the locking hinge system, the legs can be locked in a certain position when they are spread out. 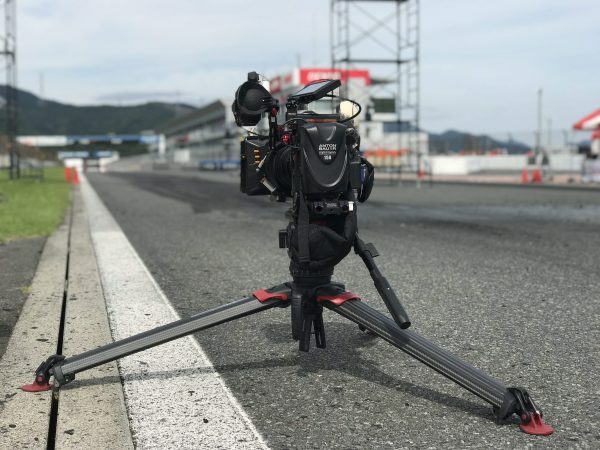 With existing Sachtler 100mm tripods, if you don’t use the spreader the legs will continue to move out and slip once you get past a certain point. If you do want to keep the spreader on, you can still get relatively low shots. By keeping the locking hinge mechanism disengaged you can adjust the spreaders all the way out and then use the center dial on the mid spreader to control the height. Below you can see four examples of how this looks. The key to the long life of any tripod, regardless of how well built it is, is regular maintenance. Tripods are often one of those pieces of kit that we take for granted and just forget about. Just like we clean our cameras and lenses, we should also clean our tripods (I know, what a foreign concept!). Sachtler recommends you regularly wipe the tripod down with a lint-free cloth. If you use it in extreme conditions you could get sand or dirt and dust entering the tripod. In this case, you should flush the tripod (I don’t mean take it to the toilet). The recommended way to do this is to place the tripod in a bucket of clean water that is at least 30cm deep and then release the brake levers and fully extend the tripod. You then repeatedly collapse and raise the legs so water is forced up through the leg sections. There have been many instances where I have cleaned my tripod with a hose or in a shower or bath. I think as long as it gets the job done, do whatever works for you. It’s not all rainbows and unicorns. The Flowtech 100 does have a learning curve and I found that it took me a few days of using it before I became familiar with how it operates. The inbuilt muscle memory you get from shooting with a tripod for so many years is a hard thing to change. 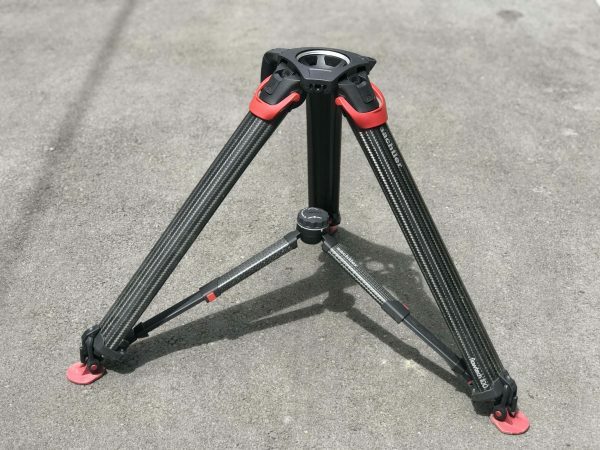 Yes, it’s still a tripod, but because it has been designed in a slightly different way you need to build that muscle memory familiarity back up. When you are using a tripod you do things instinctively and you don’t need to think about it, but for the first few days with the Flowtech 100, you do. To be completely honest, I did get a little frustrated the first few times I used the Flowtech 100. This was no fault of the tripod, but more my fault for not being more familiar with it before I took it out on a shoot. Like any new product, you should always get used to it before taking it out on a proper job. This is especially the case when trying to get your head around how the hinge locking mechanisms work. I’m still not the biggest fan of how the hinge locking mechanism operates. While technically there is nothing wrong with it, I still don’t find it to be very intuitive and I often find myself making mistakes when using it. In saying that, I don’t use the function that often, and maybe if I did, I would become more familiar with the operation. But the constant locking and unlocking of the hinge mechanism still seem a little counter-intuitive to me. With the mid spreader attached to the Flowtech 100, it rattles around a bit when you have the tripod collapsed and are carrying it. This may be a small thing, but it is something I definitely noticed. Another minor concern I have with the Flowtech 100 is that the locking brake handles can make a lot of noise when you are making adjustments quickly. Also, because the lower part of the legs sits inside, when you lower the legs down very quickly they can make a lot of noise. If you are using the tripod at say a press conference, an event, or for example on a wildlife shoot, that noise can be very distracting. The other problem with the Flowtech 100 is if the surface of the tripod legs gets wet. Because of all the carbon fibre, if it gets wet the surface becomes incredibly slippery. If you try and pick up the tripod in a hurry your hands will slip straight off it. One way around this is to use the optional carry handle, but that’s not the way I always carry the tripod. Often if I have my camera on the tripod, and I want to move a very short distance, I will pick the tripod up with the camera attached and carry it. This is potentially dangerous in the wet. 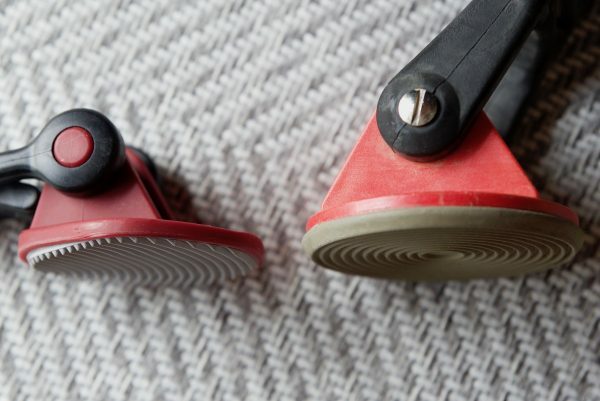 I raised this issue several times after testing out prototypes and made suggestions that perhaps some nonstick rubber could be put in a few places. 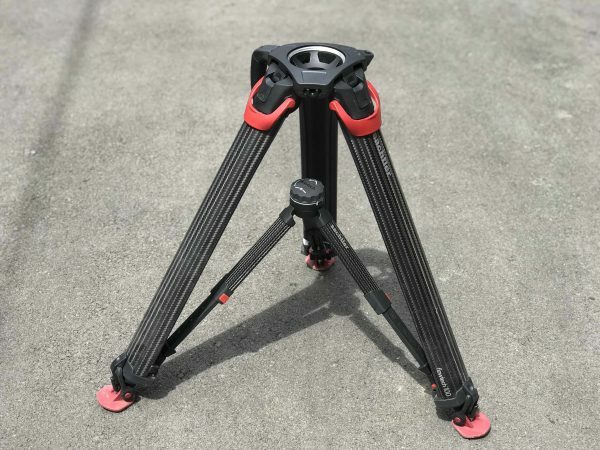 The Flowtech 100 is a little bit more expensive than some other Sachtler 100mm bowl tripod legs, such as the Sachtler CF-100ENG HD 2CF Carbon Fiber HD Tripod Legs ($3049.50 USD) with a mid-spreader and feet, as well as the Sachtler Speed-Lock CF Carbon Fiber 2-Stage Tripod Legs ($2797.75 USD) with the mid-spreader and feet. The price for the Sachtler and Vinten versions will be the same. 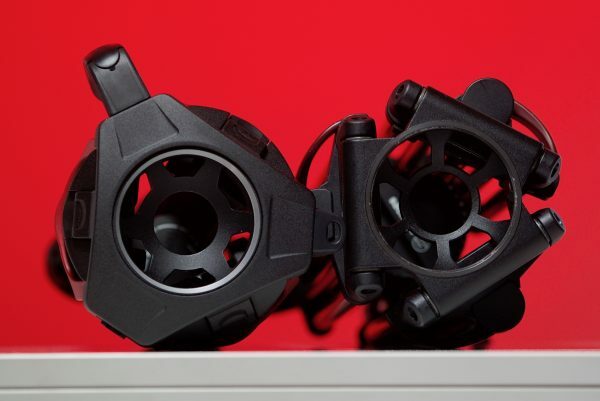 Sachtler and Vinten will also be selling various Flowtech 100 and tripod head combinations. A good tripod is one of the best investments you will ever make. When I transitioned from working full time for broadcasters to becoming freelance, the first thing I bought was a tripod. A well made and solid tripod will last you decades if you look after it correctly. The Flowtech 100 certainly looks like it is built to take anything you can throw at it. The problem with previous Sachtler tripod legs is that they weren’t always versatile enough, as they couldn’t go low enough. The Flowtech 100 solves that problem. Despite the few niggling issues I have with the Flowtech 100 I still find it a lot easier and quicker to use than any other tripod I have owned. For me speed, rigidity and flexibility are all things I look for in a tripod. A good tripod should never get in the way when you are shooting. It should be reliable and easy to use, and for the most part, the Flowtech 100 is. Having used prototypes and the production version I found it difficult to go back to something else. Is there still room for improvement? Absolutely. It’s still far from a perfect product, but in my opinion, it is still the best set of tripod legs I have used for news and documentary work.